Florist's cineraria (Pericallis x hybrida) grace flower markets and greenhouses most often in late winter and early spring, making lovely potted plants. Their daisy-like flowers include the richest array of purple, blue and pink tones seen. These hybrid perennial plants derive from plants native to the cool cliffs of the Azores, Madeira and the Canary Islands. In order to retain flowers for a long life, up to three weeks, on florist's cineraria plants, maintain relatively cool but mild indoor and outdoor temperatures. Temperatures within the range of 50 to 75 degrees Fahrenheit suffice, but optimal conditions allow for much less variance: 60 to 65 degrees during the day and 55 to 60 degrees overnight. Warmer conditions shorten the life of individual flower blossoms as well as leading to more frequent wilting. Since these plants prosper in cool temperatures, a bright indirect light exposure provides the best lighting situation in home interiors. If temperatures remain between 50 and 60 degrees Fahrenheit in a greenhouse, for example, more direct sunlight may reach foliage without harm. No more than four hours of sun daily, at dawn or dusk, still proves best. Shade helps sustain the plants without excessive air chilling or watering. 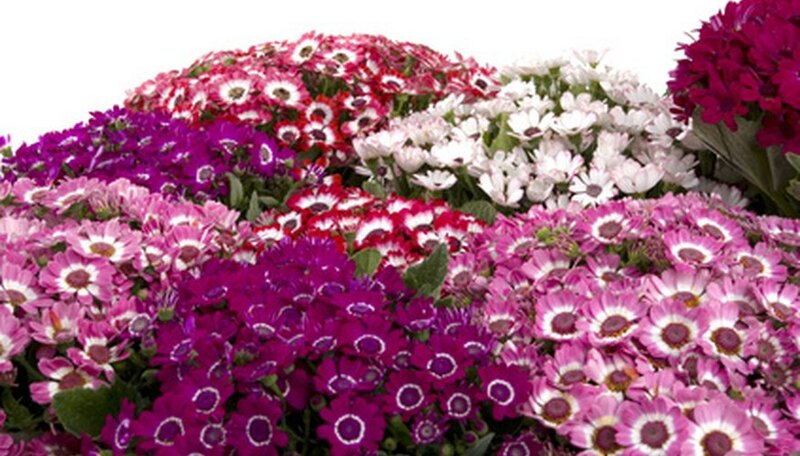 Cineraria plants need a constantly moist but well-draining soil to prevent wilting and premature loss of flowers. Temperature affects the need for water: the warmer the environment, the more frequent the watering necessary. Use caution, as over-watering and under-watering both cause wilting and poor plant performance. Apply water when the soil feels slightly moist on the surface, before any hints of leaf wilting is seen on the uppermost leaves of your cineraria plant. If plants are grown from seed and growth into flowering stage is needed, apply a liquid, well-balanced fertilizer (10-10-10) according to product label directions every two weeks as part of the regular watering regimen. Once flowering, continued fertilization does not prolong flowering or increase the display. Since this plant species needs precise light, watering and temperature requirements, it rarely is grown as a garden perennial or annual except in regions with a climate precisely like that of its native range. In cool, mild regions, florist's cineraria works as a seasonal bedding plant. Elsewhere, it makes an exceptional potted gift plant for seasonal color from midwinter through mid-spring. Once flowering wanes, discard plants rather than invest resources in retaining the plant indoors or transplanted outdoors in the garden.